Who would like to share recipes? Great idea. Perhaps rename it to Recipe Share so people on the home page see it and participate? It was my grandfather's recipe. This sounds delicious. I will have to try it. BTW can I use the search engine to find out to change the "rename of a group"or just start another group?. Sent you a PM on how to rename this post. That is a blog not a group. Oh, sorry that is not a blog, it is a conversation. If you want it moved over here to Cooking Quitters you can do it yourself via Actions > Move in upper right of this page or I can do it for you. I will be making this very soon. I will substitute with turkey kielbasa, cauliflower for the potatoes and a reduced fat cheddar cheese Thanks, sounds like a grand recipe for a grand...father. That sounds wonderful, and I love soups. Trying, for sure. Thanks, Mark! ( served cold but also good heated ) Love this over cottage cheese also Extremely Healthy and best if using fresh veggies from Farmers Market or your own garden. Bake uncovered at 350 for 35-40 minutes. 1/2 tsp terragon for Marks soup. It looks like someone posts a recipe and it just keeps moving. If you want the recipe you just print it out. Oh well. Looks like it was posted as Recipe of the Day. I am such a health nut, I look at recipes and see what I can do to lessen the sugar, salt, and carbs. Im with you, love to rearrange recipes for better healthier eating. Amish one above not very healthy with all the cheese/bacon...but the gazpacho...awesome! I also use my own tomato juice that I can when I have it...no /sodium/sugar. But V8 not to bad...you can get the low sodium. 'I love this idea to print off recipes... but can't you just copy paste the ones you like as you see them, thats what I will try anyway. Okay!! Your only 2 states away...if I remember correctly? I’ll be there! Well one does have to eat chocolate once in a while, right? The only thing healthful in this is the zucchini. It's extremely light and the orange zest is the clincher to the flavor! 2 Cups. Finely grated, unpeeled zucchini (2-9) (after grating, I squeeze out most of the liquid with a spoon until I have 2 cups of just the zucchini. Pour batter into pan and bake at 350 for 1 hour. Cool cake in pan 15 minutes. Then remove & cool completely. Dust with icing sugar. A good use for my garden zucchini. Thanks! This i will make, yum! It is with litte reduced fat cheese on top and some crackers. This is such a great idea, Jackie. Thank you for thinking of it. This is a great soup that I often make so that I have something healthy to eat at work. I'm not a big fan of kale, but I really like it in this soup. Cannellini beans are my favorite, and they are great in this. Plus, you can switch things up to meet your tastes. I modified this from a vegetarian recipe in Better Homes & Gardens, and I included the modifications in the recipe. Heat oil over medium or medium-high heat. Add ham and sauté for maybe 2 minutes, then add carrots, onion, and 1celery and sauté for maybe another three minutes or so. Add garlic and sauté another 30 seconds or more. I add the oregano salt and pepper, then sauté another minute. Stir in the broth, tomatoes or tomato paste, farro, and bay leaf. Use kitchen twine (or a rubber band) to bind the parsley together, and lay it on top of the soup. Bring to a boil (can raise heat to do this). Reduce heat to medium-low, cover, and cook for 20 minutes. Then, remove parsley, stir in kale and beans, and cook 10-15 minutes longer or until both farro and kale are tender. Taste test at this point for salt and seasonings, and add more as needed. Remove bay leaf, stir in lemon juice, and add additional broth or water if you like it a little thinner. (Farro will absorb more liquid as the soup rests.) Top individual servings with parmesan or feta. I did not think of it. It was already here. I was looking for a place to share recipes. Found this group but not too active. Thought I would throw the idea out. Seems to be working. Gonna have to try that! BTW a great side dish is spinach and cannellini. Pour some juice from the can and saute a clove of minced garlic in it, then add the rest of the can. Cook the spinach, drain and add it to the cannellini and stir it around. YUM! That sounds right up my alley. Thanks! By the way, if anyone has a favorite, baked or sautéed chicken breast recipe, I'm all ears. I like to make several at the beginning of the week, so that I can take some to work to add to my lunch, and then have an easy dinner one night for the family ( usually a chicken-topped salad). But, I've tried so many, and none are as fabulous as I want them to be! I cook a lot of chicken will look at some of my recipes to share. Thank you for sharing yours. Love your recipe. I will try this one also. Sounds like a zero point meal excluding ham. Ham does add a little kick. I will use a little ham. I picked swiss chard from the garden this morning. I am going to use this quick recipe for lunch. A Very Healthy Green. Anti-inflammatory. The coriander seeds are optional because not everyone has them in their spice rack. But if you do, please use them! Coriander is wonderful with chard. 1 Prep the chard stalks and leaves: Rinse out the Swiss chard leaves thoroughly. Either tear or cut away the thick stalks from the leaves. Cut the stalk pieces into 1-inch pieces. Chop the leaves into inch-wide strips. Keep the stalks and leaves separate. Im gonna try this. I have never cooked with Chard. Is it a Kale tasting type? The stems are a little sweet. Sometimes the leaves can be a bit bitter like beet greens or spinach. Butter outsides of bread using 1/2 tsp on each slice, then spread peanut butter on unbuttered side of one slice and spread jam on the unbuttered side of remaining slice. Sandwich bread together. Heat a medium non-stick skillet over medium heat. Place sandwich in skillet and cook until golden brown on bottom, then flip and cook opposite side until golden brown. Slice in half and serve warm. Preheat oven to 400 degrees F. Line a medium baking sheet (one with sides, like a jelly roll pan) with heavy-duty foil. Grease foil with the 1 tsp of olive oil. Slice kielbasa into ¼-inch slices. 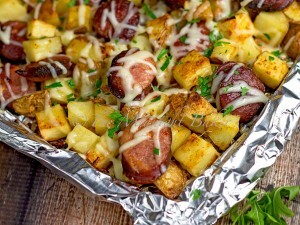 In a large bowl, combine the kielbasa, cubed potatoes, salt, garlic powder and olive oil. Toss to coat contents of bowl with the olive oil. Spread out on prepared baking sheet in a single layer if possible. Sprinkle with paprika. Bake for 30-45 minutes, stirring around every 15 minutes to insure potatoes cook & sausage browns and crisps evenly. When potatoes are soft, turn off oven; remove pan and distribute cheese across the top. Return to oven for about 5 minutes, or until cheese melts. I only used 2 large potatoes. Four seemed like a lot! It doesn’t say when to put the onions in so I just mixed it with the rest of the ingredients. I didn’t screw it up either!